Posted on April 6, 2016 by Dayna B. 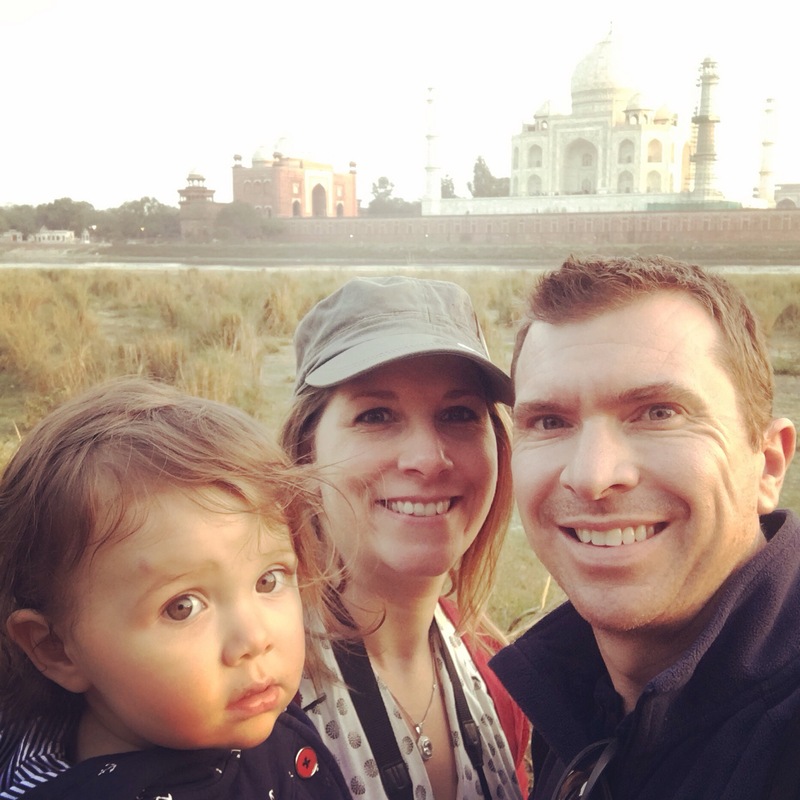 The first half of our vacation in India had us hustling and bustling to see and do so many things. I’m glad we seized the opportunity to see so many new things, but quite frankly, it was exhausting. Luckily, I had the foresight to factor in some relaxation time as well. We left the crowded streets of Delhi behind and flew south to spend 5 glorious nights in Goa. It was like we were transported into another country! Goa was so different from the India we had grown accustomed to. We took a taxi from the airport to Candolim Beach and for the first time since we had arrived in India, the incessant horn honking had finally ceased! The air pollution was no longer hovering around us and we began to remember what fresh air tasted like! We knew immediately that we were going to enjoy our time in Goa! What made our stay in Goa even more enjoyable was that our friends, Brie and Raj, were able to join us for 3 of those nights. We shared a fabulous villa in North Goa that was walking distance to the beach and we all enjoyed our first experience of the Arabian Sea. The adults sipped on cocktails before noon and the kids loved playing in the sand. If cocktails before noon aren’t relaxing enough for you, how about a 20 minute beach-side massage for $5? And…if you are really lucky, your toddler might work your lower body at no extra cost! Goa was the perfect destination for the adults to relax and for the kids to be kids. The food was delicious and the sunsets were perfect. Posted on March 25, 2016 by Dayna B. The Taj Mahal lies adjacent to the Yamuna River, and as I mentioned in my previous post, you can see the Taj Mahal from the north on the opposite side of the river. But the Taj Mahal complex was actually designed to shield it’s beauty. There are three large gates (east, west & south) from which to enter the complex. But even once you have entered the complex, you still cannot capture a full picture of her beauty. The Royal Gate is an interior gate with adjacent walls that guard the Taj Mahal from full view. The Royal Gate is made of red sandstone and the calligraphy is Koran scripture made of stone, inlaid into white marble. While standing directly in front of the Royal Gate, you can only see two windows of the Taj Mahal. Our tour guide told us it was specifically designed this way so that the gate would act as a burka, revealing only the eyes, and covering the rest of her beauty. The view as you walk through the Royal Gate is spectacular! 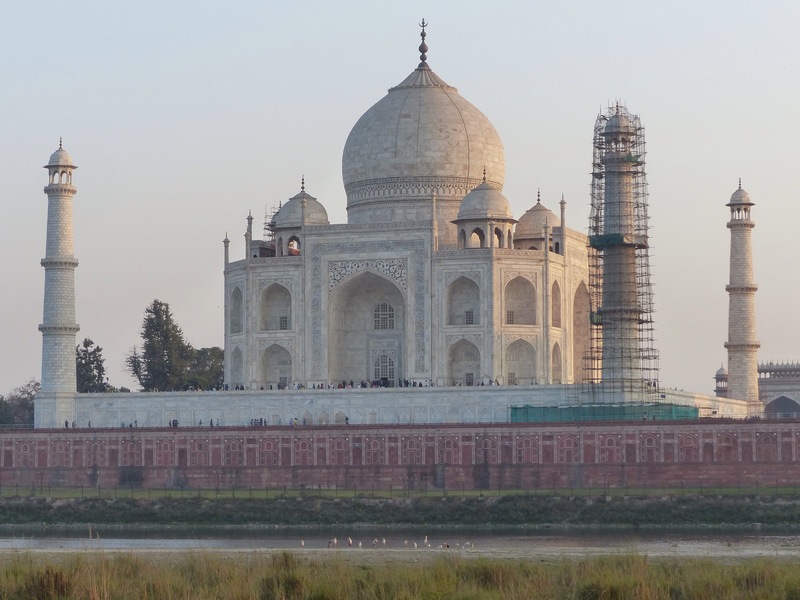 The white marble is somewhat translucent which means the color of the Taj Mahal alters in the changing light of the day. For this reason, I originally wanted to get up extra early to see the Taj at sunrise. Luckily, our driver Raj discouraged me from doing so because he warned there would likely be a lot of “fog.” I’m glad I heeded his advice because we enjoyed beautiful, clear blue skies by postponing our visit just a couple of hours. (Refer to the bottom of this post to see the sunrise view that wasn’t.) Typically the complex is only open until 7 p.m., however if you time your visit just right, there are full moon tours available at night 5 days a month. Tourists can see the Taj Mahal aglow by the full moon light on the night of the full moon, as well as two days before and two days after. Sadly, our visit did not coincide with the lunar calendar, but believe me, I checked. The white marble building took 20,000 workers 22 years to complete! But that is no surprise given the intricate craftsmanship. Just like the Royal Gate, the Koran scripture is not painted onto the marble. It is all made out of stone and inlaid into the marble. The size of the text gradually gets larger from bottom to top so that it can be read without appearing skewed when reading from ground level. The floral designs are also inlaid into the marble, made of semi-precious stones. And the intricate lattice work is all hand-carved out of the marble. You are allowed to go inside the Taj Mahal, but photos are not allowed. Inside are replicas of Mumtaz Mahal and Shah Jahan’s tombs. The real tombs are in a lower level of the building. Emperor Shah Jahan never intended to rest inside the Taj Mahal. It was meant to honor only his beloved wife. But when his plans to build a twin Taj Mahal for himself were derailed because he was imprisoned by his son…well I guess they had to improvise. There are two identical buildings on either side of the Taj Mahal. The building to the west is a mosque and the building to the east is a guest house. These buildings are not open to the public. However, the mosque is open to descendants of the Muslim builders of the Taj Mahal. For this reason, the Taj Mahal is not open to tourists on Fridays, as this is when those descendants go to the mosque for prayer. Tip for Tourists: Air pollution is VERY bad in India during the winter. The smog is so bad that you will literally choke on it. With cooler temps and lower air pressure, the smog settles closer to the ground. As the day gets warmer and the air pressure rises, the smog is lifted. It seemed to us that most of the Indian population was ignorant to this air pollution and they referred to it merely as “fog.” I can assure you it is not fog. Have you ever choked on fog? Of course not. Had we visited the Taj Mahal at sunrise as I initially intended, this would have been our view. Posted on March 21, 2016 by Dayna B. A popular tourist attraction within India’s Golden Triangle is Fatehpur Sikri, which is located along the route from Jaipur to Agra. 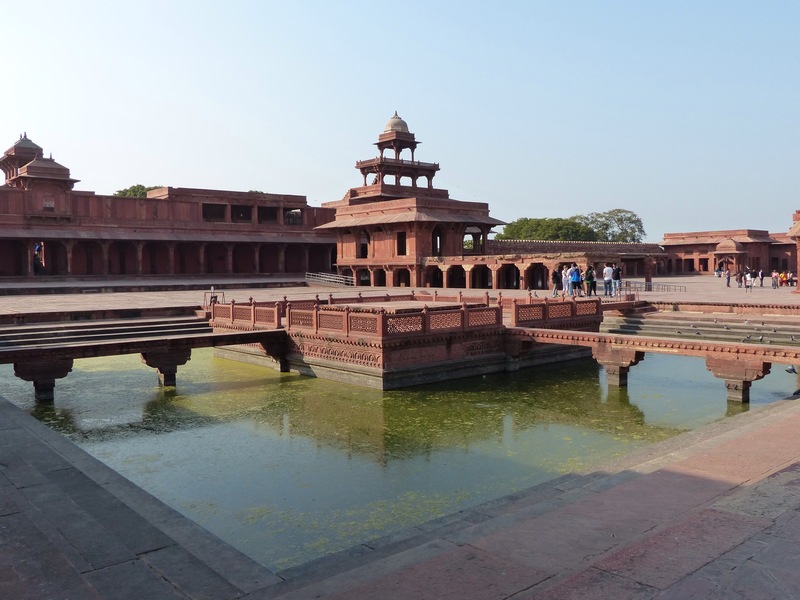 Built in the 16th century, Fatehpur Sikri was the capital of the Mughal Empire for about 15 years, before it was abandoned due to insufficient water supply. We had a very full itinerary, so we weren’t sure if we were going to take the detour to tour the palace grounds. But at the last minute, we decided we would stop just to take a quick peek. Once we arrived, we were followed by a very persistent tour guide who insisted we should hire him to show us around. We were adamant that we didn’t have time for the tour, as we were just breezing through. Worn down by his persistence, we agreed to pay him a fraction of the regular tour fee, in exchange for the short, short version of the tour. The information I retained from the short, short version is that Emperor Akbar had 3 wives. A Muslim wife, a Christian wife, and a Hindu wife, all walk into a bar, but only the Hindu wife succeeded in bearing a male heir. As a result, the Muslim wife’s quarters were about as big as a modern-day walk-in closet. The Christian wife’s quarters were a bit more respectable, but paled in comparison to the Hindu wife’s palace. The Hindu wife’s digs were actually larger than those of the Emperor himself! Men and their ridiculous need for a son…am I right? We didn’t even have time to complete the short, short version of the tour. 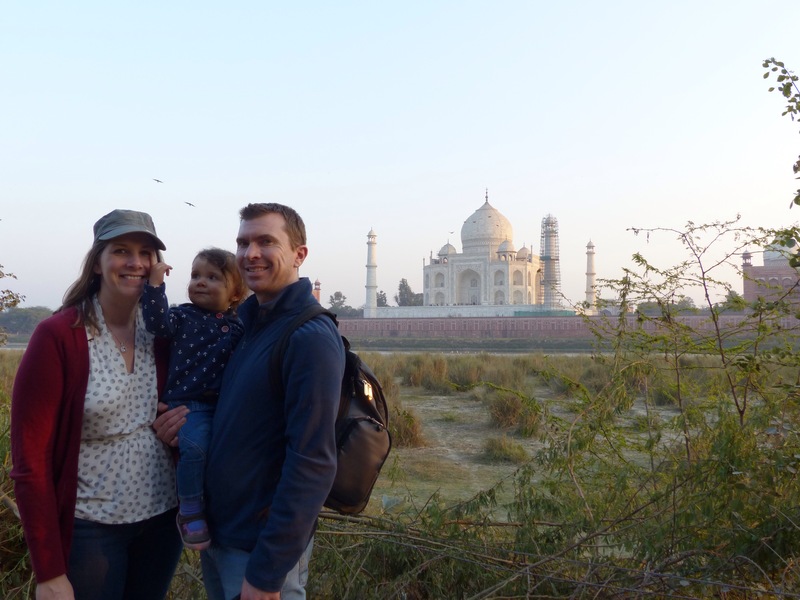 Ella was tired (read: fussy) and we were trying to get to Agra before sunset. So we said goodbye to our tour guide feeling content with what we had time to see. 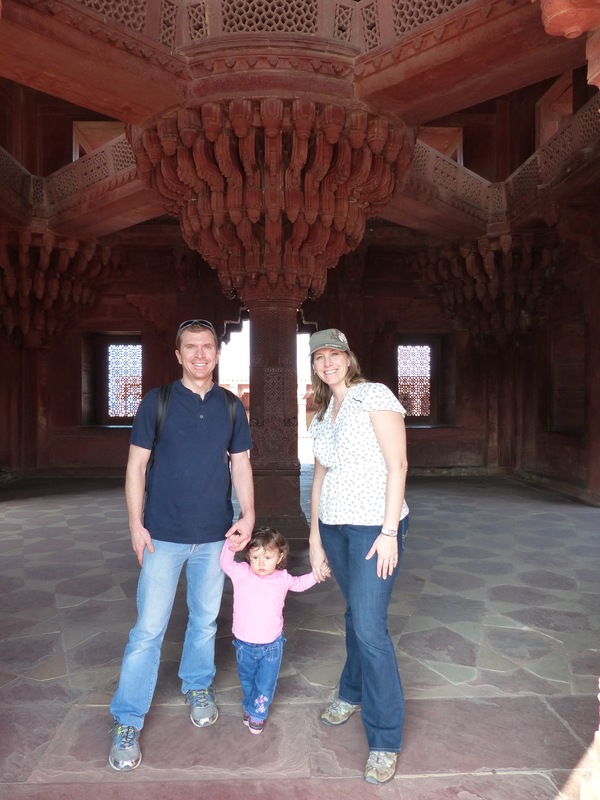 Tip for tourists: Of all the places we visited in India, Fatehpur Sikri had the most thieves and scammers by far! We observed very elaborate schemes to swindle tourists out of their money and Rob even had to step in to assist a woman that was being harassed. If you are not a savvy traveler, or lack situational awareness, I would advise skipping this tourist spot. If you are unsure if you fit into either of those categories…that probably means you do. Posted on March 4, 2016 by Dayna B. As our city tour of Jaipur was nearing an end, our tour guide asked if we wanted to visit any shops for textiles or gemstones (Jaipur is well known for its gems). I think our guide probably would have received some kind of commission for bringing us into some local shops if we spent money, but we weren’t in the market for any shopping. Instead, I wanted to visit Galtaji, an ancient Hindu pilgrimage site. Galta Temple is sometimes referred to as the Monkey Temple because of the large tribe of monkeys that live there. While planning our India itinerary, I came across pictures of this temple and decided I had to see it. Galtaji is not part of the typical Jaipur city tour as it is located in the hills about 10 kilometers away. But since we had a driver, I decided to tack this site onto our timeline. Our tour guide was not really on board at first. He was ready for less touring and more shopping so he could earn a few extra rupees (at least that was my assumption anyway). So he tried to sway me from wanting to see the temple. You see, it was a Sunday, and he told me that the pilgrims only visit the temple to feed the monkeys on Tuesdays and Saturdays, therefore, there likely wouldn’t be any monkeys there that day. Well, that was disappointing because the monkeys certainly were a big draw. But I was not deterred because the pictures I had seen online were enough to still warrant a visit. The temple is built within a mountain pass and set around a natural spring that flows into two tiered pools. Thousands of pilgrims visit each year to swim in these pools because it is believed to bring forth good luck and success. The upper pool is for men and the lower pool is for women. There were quite a few men swimming in the upper pool which didn’t seem too unusual since the water appeared to be fresh and fairly clean. The lower pool on the other hand, was pretty disgusting! Only a true Hindu pilgrim would believe that swimming in that murky water would bring about success. I’m fairly confident a dip in that pool would only bring about infection and/or disease. There were a few brave desperate women, ankle-deep in the lower pool trying to fish out coins. Not quite the spiritual pilgrimage you may have envisioned. Oh, let’s not forget about the monkeys that probably wouldn’t be there. There were monkeys everywhere! They live in these hills and I am sure they are there every day of the week. Not just on Tuesdays and Saturdays when pilgrims supposedly come to feed them. 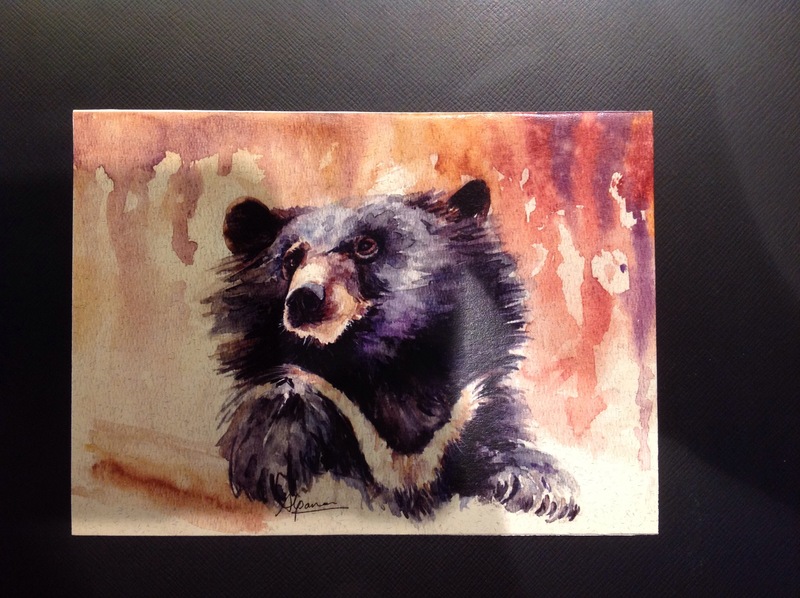 Posted on February 25, 2016 by Dayna B. There are many forts all over India that tourists can visit. We had the opportunity to visit several of them, but we passed over most of them in order to do other things. If you are like us and you don’t have time to see every fort, make sure you at least visit the Amber Fort in Jaipur. It is Jaipur’s main tourist attraction, rightfully so. 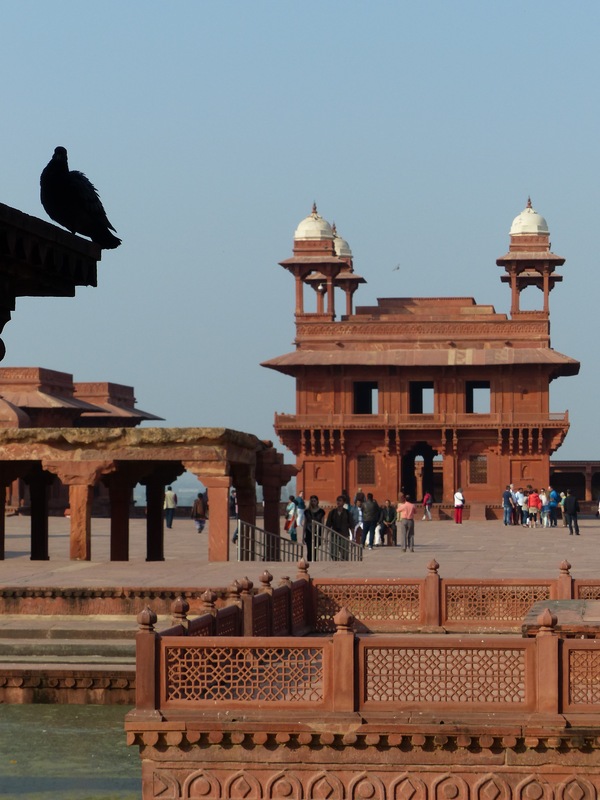 The fort and inner palace are made of red sandstone and marble. The Amber Fort was declared a UNESCO World Heritage Site in 2013. The main entrance to the fort is through the Sun Gate (pictured above: top right) which leads to Jaleb Chowk, the first main courtyard. This courtyard is where armies would hold their victory parades upon return from battle. The stairway of Jaleb Chowk (pictured above: top left) leads to the main palace grounds. The Ganesh Gate is the entry to the private palaces of the Maharajas (pictured above: bottom left). Ganesh is the Hindu God who removes all obstacles in life (pictured above: bottom right). Above Ganesh Gate are latticed windows where women of the royal family could watch functions below without being seen. The Sheesh Mahal (mirror palace) is covered with mirror mosaics that light up the entire palace with a single candle. And the carved marble panel is known as the Magic Flower because there are seven different designs within the flower that are revealed when parts of the flower are hidden by your hand. Depending on where you place your hand, the following are revealed; fish tail, lotus, hooded cobra, elephant trunk, lion’s tail, cob of corn, and scorpion. The Palace of Man Singh is the oldest part of the palace fort. The Baradhari Pavillion lies in the center of the palace courtyard and it was a meeting place for the maharanis. The maharanis were not allowed to meet privately with each other, only publicly in this pavilion to prevent jealousy and drama among the harem. Oh…and there were monkeys. Let’s not forget about the monkeys!